Limestone Flour (Calcium Carbonate) 5kg / 1kg Bucket Limestone Flour has a multitude of uses, the main use being a supplement for pet food For Chickens – Easily absorbed, limestone flour gives a real boost of calcium if they are laying soft shelled eggs or moulting, usage guide 1 table spoon per 3kg of feed weekly Tortoises, Turtles, Snails – All of these animals need calcium to form proper shell growth, can be lightly sprinkled on food daily Reptiles – A great easy to use food supplement, can be dusted on food daily, can be used to dust crickets also Horses – Calcium carbonate is widely used medicinally as an inexpensive dietary calcium supplement or antacid. Calcium is an important macro mineral, essential for bone growth, maintenance and development, particularly in young horses. Deficiency in calcium has also been associated with tying-up in performance horses, as well as DOD (Developmental Orthopaedic Disease), seen in some young, fast-growing horses. Calcium and phosphorus work together and horses require around twice as much calcium in the diet as phosphorus (a 2:1 calcium to phosphorus ratio). Cereals typically contain four times as much phosphorus to calcium (a 1:4 calcium to phosphorus ratio), which is not ideal for calcium deposition in the body. Many horse owners report a decrease in cribbing when feeding Limestone Flour. 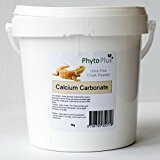 Fed at 10g per day What is Calcium Carbonate? Calcium Carbonate is found in rocks and sediments all over the world. Its produced by mining minerals rich in Calcium Carbonate then purifying, drying and the end product is then milled to a fine flour. Calcium Carbonate is found in shells, pearls and eggshells. This entry was posted in Reptiles and tagged Calcium, Carbonate, Chalk, Dusting, Fine, Powder, Reptile, Ultra by One Boutique. Bookmark the permalink.